Translated and sourced from Yokai Jiten and other sources. Teruteru Bozu, the small tissue-paper men, are a not unusual site on overcast days in Japan. Looking exactly like the tissue-paper ghosts American children make on Halloween, they hang from the eaves of houses, each one a wish for sunny weather from a child who wants to go outside and play. But what the children don’t know—and most likely the parents don’t know either—is that what looks like a simple folk-custom is actually a prayer to ancient Chinese gods and to one of Japan’s monster clan, the yokai called Hiyoribo. Hiyoribo is a legend that has been passed down for many years in Japan. He is said to come from the mountains of Hitachi-no-kuni—modern day Chiba prefecture—and his season is the summertime. 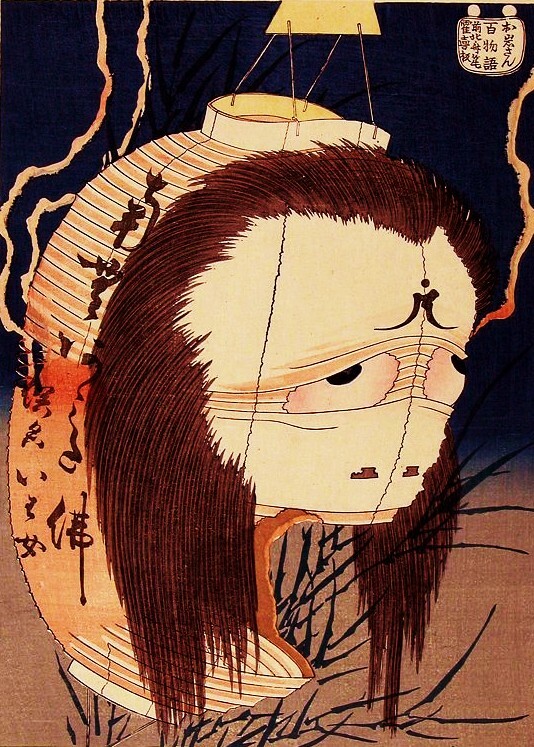 Hiyoribo is said to be a yokai who brings sunny weather, and who cannot be seen on rainy days. 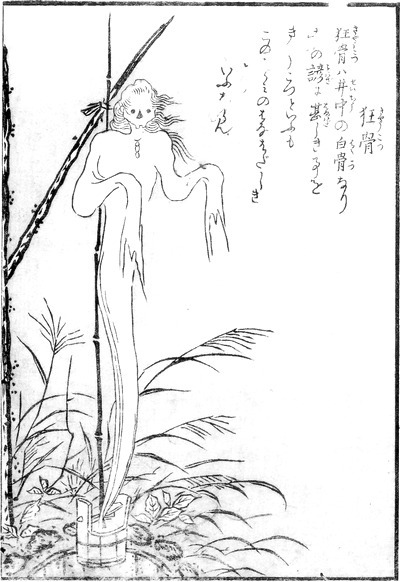 Toriyama Seiken illustrated the Hiyoribo in his picture-scroll “Supplement to the Hundred Demons of the Past,” and explained that this yokai was the origin of teruteru bozu. He said that when children hang up teruteru bozu and pray to them to bring sunshine into the rain, it is actually the spirit of the Hiyoribo that they are praying to. Teruteru bozu are made from white cloth or tissue bound together with a bit of string. They are usually hung upright from the eaves of a house, and are used as talisman in the hopes that tomorrow will bring good weather. In some areas of Japan the dolls are used by farmers on days when they hope for rain instead of sun. 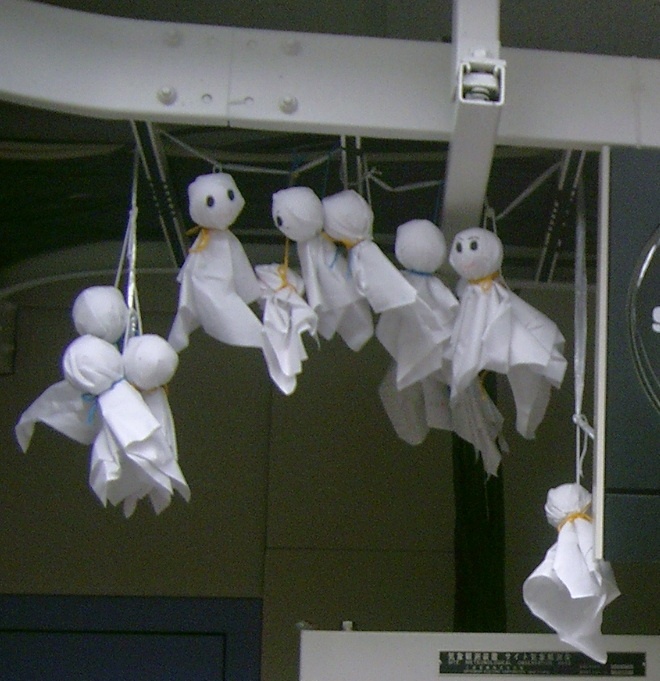 The dolls are are hung head-downwards and called furefure bozu or ameame bozu (both meaning roughly The Rain Monk) or ruterute bozu which is simply teruteru bozu said backwards. And although teruteru bozu is the most common name, they are also known as teretere bozu and sometimes hiyori bozu. Researcher Miyata Noboru has found that in certain places in West Japan they are still called Hiyoribo and remembered as yokai. Teruteru bozu appeared around the middle of the Edo period in Japan. In the book “Kiyu Shoran” (Inspection of Diversions) the author writes of the custom that if the teruteru bozu is successful, and the following day is clear, then its head is washed with sacred sake and the doll is sent into a river to be washed away. In Edo period Japan, rivers were thought to connect to the afterlife and the realm of the gods, so sending the teruteru bozu down the river was returning it home in the same way that candles and lanterns were floated down the river during Obon, the Festival of the Dead. There was also a custom where—as with Daruma dolls—a face was only drawn on the teruteru bozu if it had been successful in bringing fair weather. The origins of the custom are vague. Some say that it comes from China, where untou ningyo (cloud-clearing dolls) and ameku musume (rain banishing girls) are just a few of the similar customs that can be found. 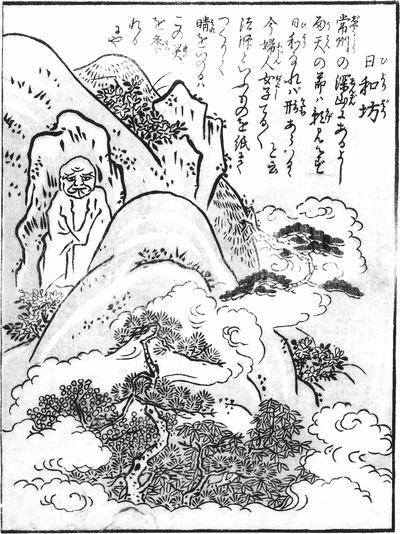 Folklorist Fujizawa Morihiko sees the origin of both the yokai Hiyoribo and the teruteru bozu in a Chinese drought-god with similar properties. Like many Japanese customs, there is a warabe uta—a folksong. The lyrics are allegedly about a story of a monk who promised farmers to stop rain and bring clear weather during a prolonged period of rain which was ruining crops. When the monk failed to bring sunshine, he was executed. This is one of those ubiquitous pieces of folk magic in Japan that people have long forgotten the origins. They look exactly the same as the tissue ghost puppets I made as a child, but with very different intent! When I lived there, I saw teruteru bozu all over the place but no one could really explain what they were or why they made them. All they knew is that little kids made them to pray for the rain to stop when they wanted to go outside and play. I went digging and found the yokai origins of the little cotton charms. Be careful when you pull up a bucket of water from an ancient, abandoned well. You might get more than you bargained for if a kyokotsu 狂骨—which translates literally as “crazy bones”—springs up from the bucket like a Jack-in-the-Box to deliver its curse. Clad in a white burial kimono, kyokotsu almost look like a classical yurei but they lack the black/white contrast due to shocks of white hair that spring from its bleached-white skull. Kyokotsu appear as little more than bones wrapped in a shroud, springing from a well. Sekien’s text seems to explain that kyokotsu appear from a well in response to some wrongdoing and bearing a terrible grudge. Seiken also claimed that the regional-dialect term “kyokotsu,” meaning “violent” or “furious,” is an allusion to this yokai. However, while such a term does exist, specifically in Tsuki-gun in Kanagawa prefecture, there is no concrete evidence linking either the term or Seiken’s picture to an older folktale. It is much more likely that the opposite occurred, that Seiken heard the term “kyokotsu” and decided to invent a yurei to match—much like if an English-language author decided to create a monster called “Lazy Bones” after the pre-existing term. To get the image for his yokai, Seiken was probably just playing on works, combining the local term “kyokotsu” (crazy bones) with “gyokotsu,” which means bones from which all of the meat has fallen off. He might also have been influenced by the words “keikotsu” or “sokotsu” which can mean drifter or wander, but also can be phrased as “someone from the bottom.” It seems likely that Seiken was influenced both by these words and by the old belief of an inexhaustible grudge that can come from the bottom of wells. 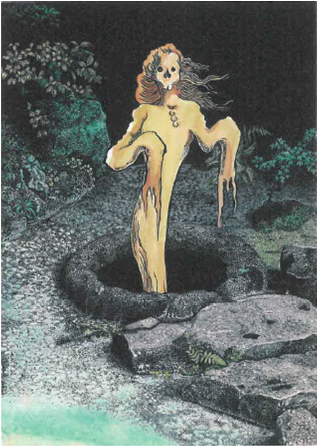 There are several Japanese folklore stories—involving both yokai and yurei—that involve the bottom of a well. In Japanese folklore, water was a channel to the world of the dead, and the bottoms of wells were directly connected. Wells also served as a convenient hiding place for murders committed in the dark of the night, and the superstitious believed that any such-disposed of corpse was capable of a powerful curse. Those who died from falling in wells, by accident, suicide, or murder, were thought to transform into shiryo and haunt the well. The spirit connects to the well itself, rather than where they were murdered, and their curse is likely to fall on anyone who used the well and not specifically targeted to the murderer. A cursed set of bones is another typical trope in Japanese folklore and does not need to be connected to a well. In her book “Nozarashi Monogatari,” the literary scholar Sawada Mizuho wrote a similar story of a weather-beaten, abandoned skull that gets its revenge. The biggest difference between the kyokotsu and typical Japanese folklore tales of skeletal ghosts is the element of disparity between the spirit form and the physical remains. In most stories, the spirit resembles a typical Japanese yurei—with a physical, full human body—even while the discovered remains are nothing more than a pile of rotting bones. The kyokotsu is rare in that Sekien drew the spirit in skeletal form as well. Because of this, kyokotsu is most often identified as a type of yokai, being a possessed skeleton, rather than a type of yurei, a Japanese ghost. Translator’s Note: The manga series “Bleach” has a character called Katen Kyōkotsu that uses the same kanji as this yokai, but seems to have no other relationship.